Did you know you can fix a scratched DVD with a banana. Next, wipe it down with the banana peel (the inside). The wax from the peel will help polish and further clean the disk. Voilà! Your scratched CD or DVD should now look like new! 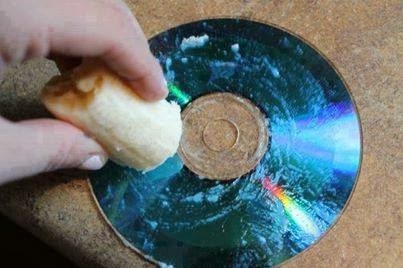 Please note that this trick will also help you repair scratched Playstation and Xbox CD’s and DVD’s.